I watched this episode last night after a few cans, and I have to say it's one of my favourites. It has some of the best dialogue between Terry and Arthur that I have seen in any Minder episode, particularly in the opening 20 minutes. There's also a nice bit of ad-libbing by Arthur and Terry in the scenes where the horse gets a bit agitated. Not to mention the classic scene where Arthur, upon hearing Terry say (refering to a china statue he'd been shown), "I bet you wish you had a hundred," casually pulls a blind to reveal '2 gross' of copies. The timing is perfect. I hadn't previously remembered it as a stand out episode, probably because watching a box set of 23 episodes over a couple of days tends to desensitise you a bit. But last night I was laughing my head off, and I kept having to rewind it to see the bits I'd missed while trying to compose myself. I personally think series 2 has the sharpest, tightest scripts of all. 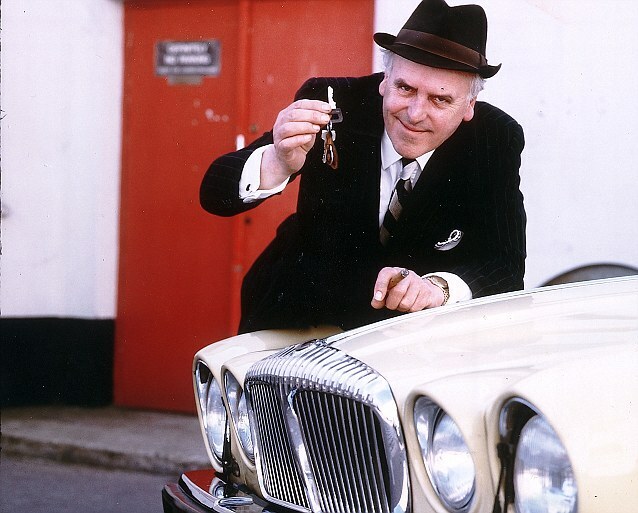 Although it is generally considered that series 3 was where Minder really kicked in, I find the early years are the ones I keep coming back to. I highly recommend it as a bit of post-pub entertainment. ....and let's not forget that classic scene where Terry minds the farting horse and afterwards enjoys the special diet for the 3-year-old. Here are two articles, one from TV TIMES and the other from the Daily Mirror from Wednesday 23rd April 1980 with some background information. 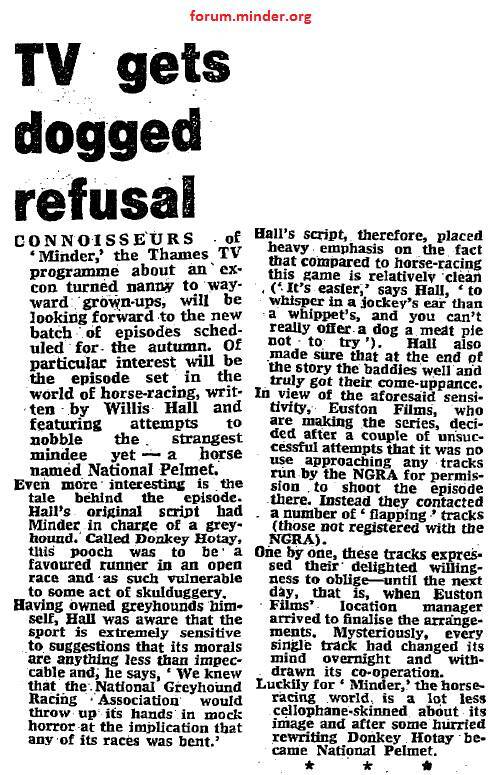 It seems the episode was originally intended to be about greyhounds and both articles mention that Liza Goddard's finger was bitten by a horse during filming. It also seems our Dennis ended up in hospital too (see TV TIMES article). Based on the info here, I would assume therefore that the filming date for this episode was somewhere in the preceding days before the Mirror article. This ep has one of the best ever Minder scenes...on the train to Brighton! Sheer class, Arthur & Terry swaying all over the place, buying a fruit pie and dodgy sandwich and moving out of the way for backpackers and Arthur telling Terry about Mugs and "Pakistani craftsmen or no Pakistani craftsmen!" ....Arthur making his way along the train corridor only to shuffle back the way he came to let the backpackers through always makes me laugh. I don't know if this scene is meant to be comical and to be honest, there shouldn't really be anything funny about it, it's just GC's body language and facial expressions that steal the show again. Continuity blooper at 33.30, horsebox reg is RLT109E, 30 seconds later at 34.00 it's RLT109P to match the Range Rover. Interesting that this episode was originally going to be about greyhound racing, Arthur and Terry bicker in a couple of episodes about Terry's preference for the dogs. Watched this again yesterday, another quality episode with lots of good dialogue, a great marker laid down for the second series. A trip out of London also adds to the episodes quality. An appearance by a few well known faces, Jim Norton, Robert Swann, Liza Goddard and one of my favourites Ken Hutchison, whatever happened to him? One of my favourite bits was when Arthur was swanning around the plush sea front hotel, only to discover his peace and tranquility to be short lived due to building works, sort of a comeuppance when you consider poor Terry had to bed down with a farting Horse. Also the end part when he wants the statues painted to be knocked out to football supporters, he would probably get away with that nowadays quite easily. One of my least favourite Terry episodes. Not a great storyline for me and I struggle to find very much I like in this episode. Only bits I enjoyed were Arthur & Terry travelling to Brighton on good old British Rail and the bit in the Antique Shop. I think Ken Hutchison's character was a complete waste of a decent actor - they should have saved him for a much better role in another episode IMO. Not the best episode to start Series 2 for me. I started watching season two today and it's off to a great start. So many fine moments and lots of quotable dialogue. Repainting the Miltons into Footballers was hilarious! Started watching from Episode 1 and have now reached Series 2, I rather enjoyed this one, as am local to Brighton, so was nice to see some of the area. I am not sure what beach they are on later though with the horses, as that was not Brighton, you got to love TV editing when they walk out the shop and are so swiftly at the stable, not sure where that was filmed, nearest race track would be Plumpton. Story line was not the greatest and a bit of a let down with the so called villain at the end. Wonderful episode to start series 2. Terry and Arthur now becoming a great double act. Great comic timing from Dennis in dealing with the flatulent horse and realising he's eaten the horse food with laxatives. I couldn't agree more with that statement. A great actor, and after a quick IMDB check appears not to have acted since 1999. I also did a quick what is he doing now check and found very little. His performaces in 'Just a Boys Game' is superb, worth checking out if not done so already. WOuld have played the part well in the episode where Terry and the Scottish guy have a fight on the bus at the end, Brian Cox appeared as the actor in this, but cannot remember the name of the episode. It's 'In' Series 3 Episode 13. Brian Cox did a great job in this episode but Ken Hutchison could have played that role. He certainly deserved a better part than Brickett in 'National Pelmet'. Rumours of horse racing being bent have been rife for years but not so with Greyhounds. I suppose it's a lot harder to 'fix' a Greyhound race as there is no human participation in the actual event. Gave it a 4/5 - nearly gave it 3.must have been a slight disappointment to start of series two, after such a great first series. Somehow Terry looked "more 70's" than he did in the previous series,especially at the start - with his haircut & jacket combo. Always turn it off before screechy woman screeches at the mental bloke. However love the Bishop Brennan stuff. Arthur spots Watson Everrit, the trainer, in the beer tent who Arthur says Burnham Jones has some horses with, i think. And there's the connection. One of my favourite episodes (from series two), which I can remember watching on Video, one night, at 9.00pm, a very enjoyable 50 minutes, have seen the episode, a few times, since. There are lots of things I like about this episode, including - the scenes, on the train to Brighton, Arthur (in his hotel room), looking smug and satisfied (while Terry was left guarding Pelmet), until he stepped out on to the balcony, Terry being pursued by Rita, and the scene where Terry and Arthur, are sitting on the bench, at the Seafront. Plenty of classic lines in this episode, including - horse food, I'm eating horse food, no, I'm not spending another night with that horse, it farts, when the ball hit the back of the net, I was over the moon, Brian - Kevin Keegan. Continuing my second visit to the Minder manor and I have reached this great episode. I loved this episode the first time I saw it and enjoyed it even more the second time. Dennis and George are in top form through out. I especially like all the dialogue and double talk involving the Milton statues. Some of the best Terry-Arthur dialogue sequences are those moments. Turning the Miltons into footballers is inspired. I also like the way Terry's attitude about horse sitting changes instantly when an attractive woman shows up. An all around great episode with too many wonderful moments to list here. Feels like a nice treat for Waterman's character, for him to be taken everywhere around the UK. A nice start for the new series considering that Minder was still new and not known for at the time. Great episode,as other members have already commented,but I will also. The train journey with Arthur and Terry...CLASSIC MINDER AT ITS BEST..! "I know he's bent, bent but I mean bent peculiar." Surprised this got past the ITV hacksaw.